San Francisco Ballet's Jennifer Stahl in William Forsythe's "Pas/Parts." Photo by Erik Tomasson, Courtesy of SFB. The past few months have brought promotions galore. We already shared Miami City Ballet's list in May as well as the major news from American Ballet Theatre last week, but we rounded up the news from nine other major companies to keep you in the loop. Exciting news came from London last week when Yasmine Naghdi was promoted to principal dancer after what director Kevin O'Hare called an "extraordinary year." Additional promotions include Matthew Ball and Marcelino Sambé to first soloist, and Reece Clarke, Benjamin Ella and Anna Rose O'Sullivan to soloist. Hannah Grennel, Calvin Richardson, Gina Storm-Jensen and David Yudes will take on the rank of first artists. Yasmine Naghdi in "The Sleeping Beauty." Photo by Tristram Kenton, Courtesy of ROH. With the retirement of longtime principal Lorena Feijoo and husband and wife team Davit Karapetyan and Vanessa Zahorian after the 2017 season, SFB had big (ballet) shoes to fill. In June the company announced ten promotions, including eight new members and six apprentices. Who's moving up? Jennifer Stahl (check out her crunchy kale recipe here) has been promoted to principal, and Isabella DeVivo, Jahna Frantziskonis (our February/March cover star), Esteban Hernandez and Steven Morse will be soloists. Filling those spots in the corps are SFB apprentices Alexandre Cagnat, Shené Lazarus, Davide Occhipinti, Nathaniel Remez and Isabella Walsh. Ulrik Birkkjaer and Ana Sophia Scheller are coming into the company as principals as well as a list of new corps members including English National Ballet dancer Madison Keesler. This spring will bring SFB's exciting Unbound festival of new works, and we're looking forward to seeing these dancers get their moment in the spotlight. ENB's Cesar Corrales. Photo Courtesy of English National Ballet. ENB wunderkind Cesar Corrales was promoted to principal over the weekend. 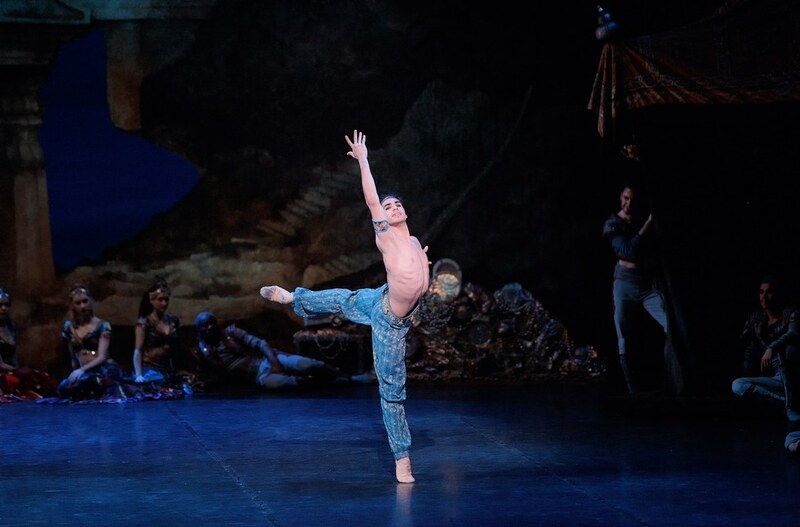 Artistic director Tamara Rojo announced his promotion onstage in front of the entire audience and company after a rousing performance in Le Corsaire while on tour in Japan. At just 20 years old, Corrales will be ENB's youngest principal. In case that's not enough, Corrales was the 2016 winner of both ENB's Emerging Dancer and People's Choice Awards. Aaron Robison has left San Francisco Ballet to join ENB as a lead principal, and Joseph Caley of Birmingham Royal Ballet will join as a principal. National Ballet of Canada's Jurgita Dronina also joins as lead principal, and she will split her time between the two companies. Speaking of National Ballet of Canada, artistic director Karen Kain announced five promotions last month. Emma Hawes (get her workout tips here), Hannah Fischer (recent star of Wheeldon's The Winter's Tale) and Brendan Saye are becoming first soloists, and Félix Paquet and Ben Rudisin will be promoted to second soloists. Breaking news! Colorado Ballet artistic director Gil Boggs announced company promotions today. Asuka Sasaki is being promoted from soloist to principal and Christophor Moulton is moving from the corps to become a soloist. Tracy Jones, a 2013 Pointe "Star of the Corps," was also promoted to soloist. Arianna Ciccarelli and Mackenzie Dessens are joining the corps after apprenticeships. Artistic director Adam Sklute announced three promotions at Ballet West: former first soloist Adrian Fry is now a principal artist, and Chelsea Keefer and Gabrielle Salvatto become demi soloists. Ballet West is also bringing in new corps dancers from their second company, Ballet West II, as well from this past year's national audition tour. Ballet West's Adrian Fry. Photo by Rosalie O'Connor, Courtesy of Ballet West. Across the country in Pennsylvania, 13 dancers will be moving up in rank. Soloist Dayesi Torriente, previously with National Ballet of Cuba, will be promoted to principal, and Alexandra Hughes will become a soloist. Current apprentices Jacqueline Callahan, Emily Davis, Therese Davis, Alexandra Heier, Siobhan Howley and Jack Sprance will move up to the corps while a new group of apprentices take their place. Tulsa Ballet celebrated their 60th anniversary this season with the world premiere of Dorothy and the Prince of Oz, and are heading over the rainbow and into their 61st with three new company members and three promotions. Cavan Conley and Shuhei Yoshida are becoming soloists and Jessica Payne is joining the corps. This top Canadian company promoted five dancers including Alanna McAdie from second soloist to soloist, Liam Caines from corps de ballet to second soloist, and Jesse Petrie from apprentice to the corps. Halfway through their 2016/17 season apprentices Yue Shi and Saeka Shirai also advanced to the corps. Whew! We just threw a lot of names your way. But keep these talented dancers in mind for the incredible accomplishments surely yet to come.